Photo by Matt Leidecker The trail to Alice and Twin lakes in the Sawtooths offers bursts of fall color along Pettit Lake Creek courtesy of isolated shrubs. Mid-September is the best time to catch the color, and a perfect time to enjoy hiking the Sawtooth and Sun Valley areas’ many and varied trails. After a long, hot (and smoky) summer, the crisp, cool mornings and extended evenings of the Wood River Valley fall offer the perfect climate to get out and hike. The coming weeks are the ideal time to catch the changing leaves (see sidebar), and if there’s one thing this area has in abundance, it’s hiking trails. From three-day-long treks in the Sawtooths to lunchtime strolls around the White Clouds Golf Course in Sun valley, there’s a whole lot of something for everyone here. But for those new to the valley, or stuck in a hiking rut, here are some great options on where to go to get the skinny on the wide variety of hiking trails in the area. During the past few years, a cornucopia of hiking books have hit the area’s bookstores and sporting goods shops, following in the footsteps of the grande dames of local hiking guidebooks, Margaret Fuller with her “Trails of the Sawtooth and White Cloud Mountains” (first published in 1979, last updated in 2011) and Gloria Moore with her “Day Hiking Near Sun Valley.” Moore’s handy green binder, first published in 1987 and updated in 1997, is still in print, though there are no plans to update it. The newest addition to the hiking library is Matt Leidecker’s “Exploring the Sawtooths: A Comprehensive Guide”. The follow-up to his 2010 book “Exploring Sun Valley–A Comprehensive Guide to the Boulder, Pioneer and Smoky Mountains,” “Exploring the Sawtooths” was published last month. Printed on synthetic waterproof and tear-proof YUPO paper, this guidebook is a hardy companion out on the trail. From detailed color topographical maps and trail descriptions to historical and geographical information, plus a handy full-color wildflower guide, this compact book packs a heavyweight punch. Each hike comes with a map on the facing page, directions to the trailhead and a detailed description of the route. Judy Demetre at Iconoclast Books in Ketchum agreed, but pointed out that Leidecker’s books can be a bit intimidating for the casual hiker. “The Day Hiker’s Guide,” with a separate edition for Stanley, by Scott Marchant, is very straightforward and simple. Marchant groups hikes by area, and offers some useful lists of the best kids hikes, aerobic hikes, wildflower, wildlife and view hikes, among other options. Each individual hike starts with a quick reference guide detailing facts such as distance, elevation gain, difficulty rating, time and, helpfully, water availability. Marchant then provides a summary of the hike followed by directions to the trailhead and a more in-depth description of the route. There is also a simple map on the back page of the book showing the location and number of each hike in the area, making it easy to quickly find a suitable hike based on your current location. Other quick-and-easy guidebook options include “Easy Hiking Near Sun Valley,” a slim volume with a selection of simple hikes from Gloria Moore’s bigger “Day Hiking Near Sun Valley,” and Adventure Maps’ trail maps. These are maps with some guide information included and are printed on waterproof and tear-resistant Polyart. 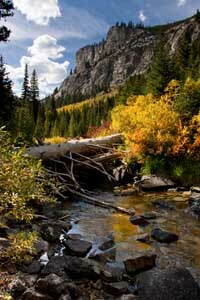 Hyndman Creek: Great early fall hike for some spectacular color on the lower flanks of Cobb Peak. There are also some pockets of aspens that go off as you climb into the main Hyndman Basin, but the best color viewing happens between the trailhead and the pond near the Sun Valley Trekking yurt at 8,724 feet. Cobb Peak: The colors peak at the base of Cobb Peak and the junction with Big Basin in mid-September. The colors in the avalanche paths and at the junction of Hyndman Creek and the North Fork of Hyndman Creek peak later in the month. Big Wood River. The highlight of valley-bottom color happens over several weeks between the last week in September and mid-October. Silver Creek/Boulder foothills: The huge grove of aspens at the beginning of the Silver Lake trailhead rarely reaches its full potential. The color can range from a dull brown to a brilliant orange. The lower-elevation Silver Creek basin holds the best color and is well worth a walk through the mixed forest in mid-September (no trail). There are several drainages along the foothills that are worth wandering through to appreciate the fall color. Cross at Billy’s Bridge and wander up the canyon where they set the skate-skiing tracks (no trail).